TAndem REpeat ANalyzer -TAREAN – is a computational pipeline for unsupervised identification of satellite repeats from unassembled sequence reads. The pipeline uses low-pass whole genome sequence reads and performs their graph-based clustering. 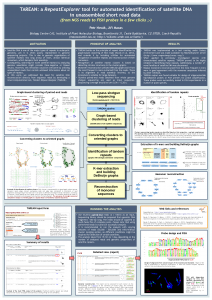 Resulting clusters, representing all types of repeats, are then examined for the presence of circular structures and putative satellite repeats are reported. Install a local instance of the pipeline using its source code available from bitbucket repository. Use public Galaxy-based server at https://repeatexplorer-elixir.cerit-sc.cz/. The server is provided in frame of the Elixir CZ project and is maintained by CESNET and CERIT-SC. Simple registration is required to use this service. Development of TAREAN was supported by ELIXIR CZ research infrastructure project (MEYS Grant No: LM2015047). 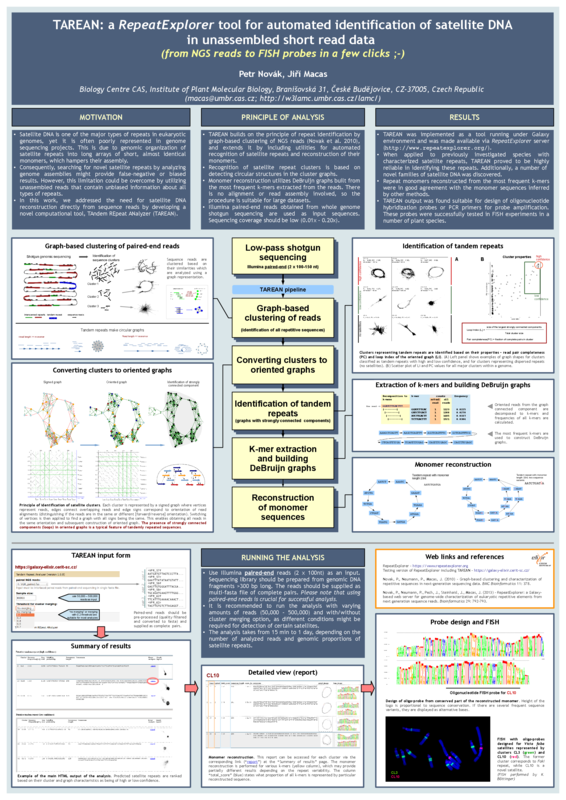 A brief overview of the TAREAN principle can be found on our poster presented at the 21st International Chromosome Conference (July 2016).